I am always open to offers for photography, writing, or food-based collaborations. Contributed some restaurant and bar recommendations to the book Eat Like a Local TOKYO. 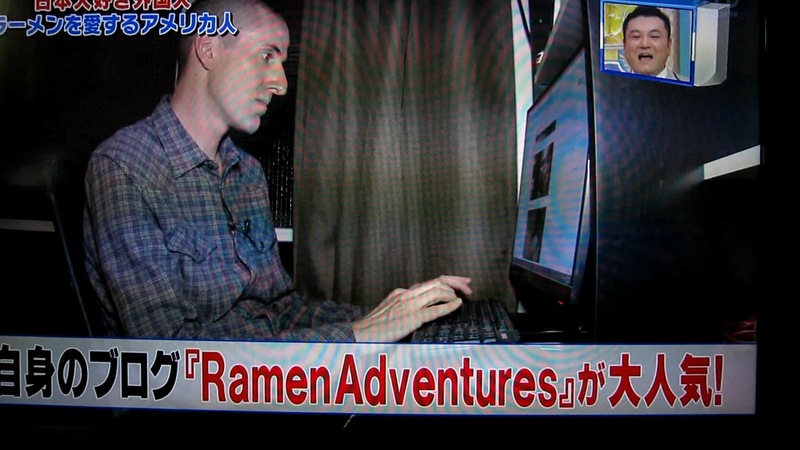 I was on the long-running Ramen Walker television show. Check it here. Aired March 2019 on FUJI BS and will be on YouTube many months later. Japan Forward is the English wing of the Sankei Shinbun newspaper. I will be doing a regular column with the. The intro piece is here. March 2019. Herameke Denkikki is a late-night show where a panel speaks with an idol group and an author. Super random show filmed live without any rehearsal. They invited me back if I finish my next book. Website here. Aired December 2018. I met up with writer Mickey Rapkin (author of Pitch Perfect!) for a travel piece he worked on. December 2017 and May 2018. Interviewed by Chris and Tiara about ramen. You can subscribe to their podcast here. I'm not sure what this show is, but somehow they got hold of some work I did for NHK and incorporated it into their 30-minute program. I think it is an advertisement for a ramen school. Oh, and I don't get any credit for my appearance. I'm not mad, just curious how the business works. Interviews for an article in this Swiss paper. April, 2018. Interviewed for Overseas American, a site dedicated to the lives of Americans living abroad. Here. Interviewed for GQ.com about my work with the Palace Hotel (I am their official ramen hunter). I wrote a book with the help of the Osaka Ramen School. Simple recipes for the home cook. Helped the ramen chain らぁめん花月嵐 promote their September 2017 ramen, Ore no Torisoba 2017. Check it out here. Teamed up with Maction Planet for a t-shirt collaboration. Check it out here. 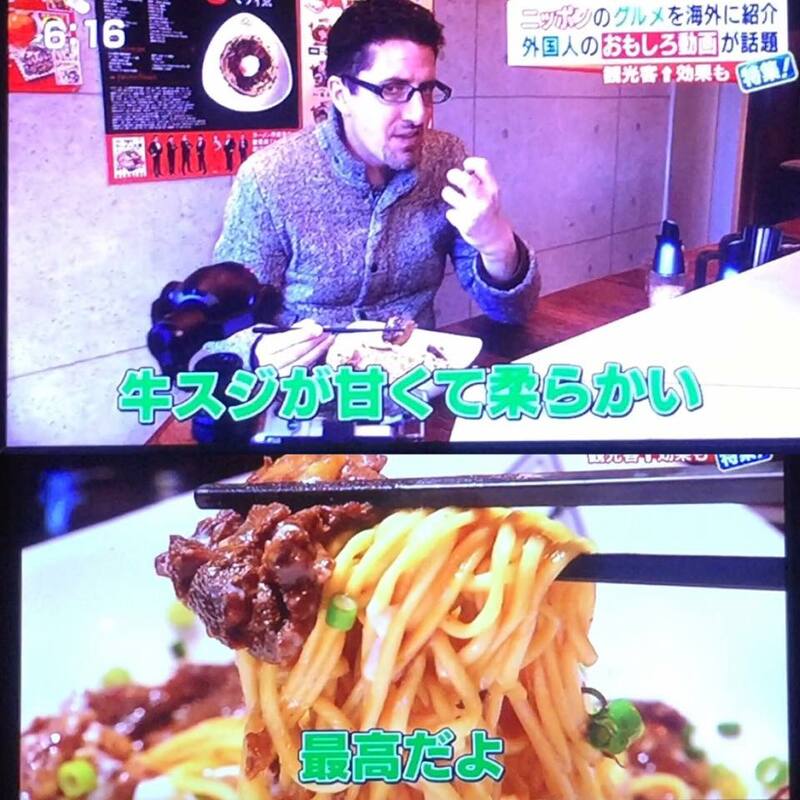 Interviewed for a piece about the state of ramen in Japan. You can see it here. July, 2017. 金曜イチから is a show on NHK. They followed me around on a ramen tour. Aired May 19th in Japan. The show's site is here. I was interviewed by radio host Manamiki about my #ramenriders project. Aired May 5th. Manamiki's blog is here. Commented about the rise of instant ramen as a currency in American prisons. April 13th on the internet news channel here. Even though we talked about prisons, I went off on a tangent about the ramen burger, and they aired that separately on another day. A "battle" type show about the best ramen in Takadanobaba. I commented on the best 7, along with 3 other ramen critics. I was only on air for about 10 seconds, as the show was more focused on the TV talent going to different shops. April 4th, 2017. See the page here. I appeared twice in one week on the daily news show N-Star on TBS. Once was and interview at the Ramen Museum, and the other was showcasing foreigner YouTubers in Japan. March, 2017. 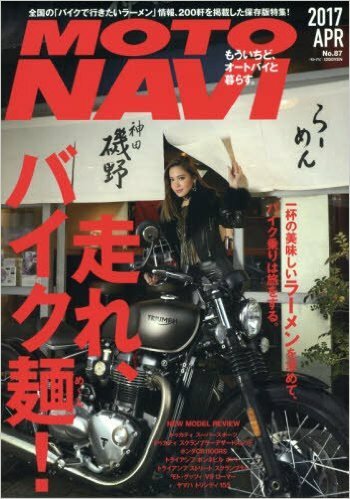 4-page spread about motorcycles and ramen in Japan's #1 bike magazine. Featured in the Singapore Airlines magazine in an article about global ramen. 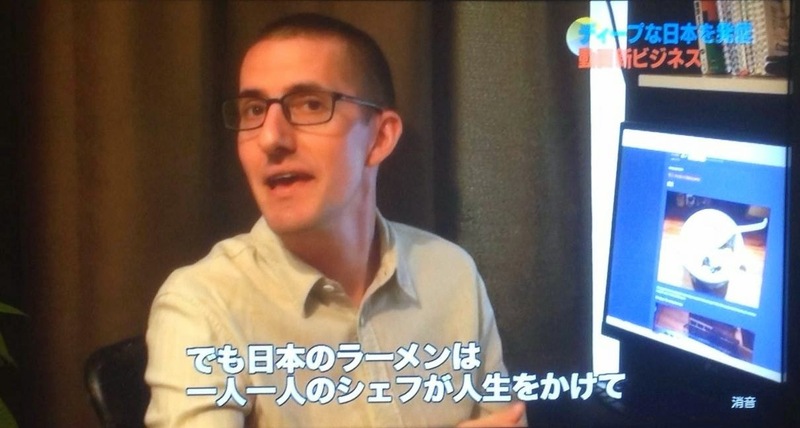 I was interviewed as an expert. First quarter, 2017. Wrote a guide for Eater's Tokyo guide. The best shops in every neighborhood. Check it out here. Live from February, 2017. Yummy Japan is a YouTube content creator focusing on Japanese food culture. My channel is, of course, about ramen. If you can, please subscribe! Interviewed for Singapore Airline's in-flight magazine about the ramen scene in Tokyo and abroad. 1st quarter, 2017. I provided photos for a Korean youth magazine related to chocolate ramen, something that exists around Valentine's Day every year. No link, but maybe it is this magazine. January, 2017. Fun article about slurping techniques. See it here. Published January, 2017. Two lady-centric sites from Singapore put up a best-of list I made, showing readers 11 great shops in Tokyo. Ramen is universal! Links here and here. December, 2016. Interviewed about Ichiran's NYC opening. Link here. November, 2016. The Japanese government's official English magazine. Vol 103 features a lot about food, and you can learn a bit about my ramen adventures. Site here. November, 2016. 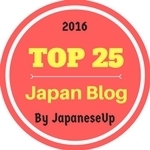 Named a Top 25 Japan Blog. August, 2016. Provided some photos for a TIME Magazine piece about cheap Michelin-starred food. August, 2016. I chose three shops that are important for the foreigner/Japan relationship. You can see it here (Japanese). July 18, 2016. I was a contestant on this game show. Four of us competed to see who knows the most in their respective category. It came down to the line, and I'm happy with 2nd place to the castle expert. Site on Asahi TV is here. Looks like it is over here to view. On air June 16, 2016. Molly Rose Brewery founder Nic visited Japan, took a ramen tour, and wrote about it for the Australian craft beer scene. Who doesn't love craft beer and ramen! Read it here. April, 2016. I wrote a special feature for WAttention Tokyo, a seasonal free magazine about Tokyo. You can find it an most tourism offices and hotels. It's the Spring 2016 issue. I did a quick interview on the morning show 日本全国8時です - All Japan 8am. We spoke about ramen and my book . . for 12 minutes. Aired February 27th, 2016. Toured around with the travel filmmakers at Attaché for their Tokyo travel show. On YouTube here. I gave an hour long lecture about local ramen throughout Japan at Lakeland College. They have monthly free lectures. February 17th, 2016. Interviewed by Nakagawa Shoko (Shoko-tan), about my ramen obsession. Aired February 13th, 2016 on BS. The homepage is here. Interviewed on 81.3 FM J-Wave, a Japanese radio station. Smile on Sunday's site is here. There's a tweet about it here. We talked about some of my favorite ramen shops in Tokyo. Aired October 11th, 2015. Interviewed by boutique a travel company about my ramen adventures in Japan. Check it out here. A segment called Zero Human, on the nightly news program News Zero, did a short piece on me and my book. Aired in Japan on September 17th, 2015. Weekly Post magazine did a profile of me and 10 ramen shops that I love in Tokyo. On Japanese newsstands August 31st, 2015. Interviewed for the 2015 Autumn / Winter issue of Kateigaho International, a magazine focusing on travel and culture in Japan. Available in bookstores and online. Introduced two of my favorite ramen shops to musicians Keri Pamyupamyu and YOSHIKI on a show hosted by Japanese boy band Kan Johnny 8. Aired August 30th, 2015 on TV Asahi. Show website here. Foodie program shown inflight on ANA flights in Japan and abroad. Broadcast from August 2015. Can be seen on flights as well as some premium TV services in Japan. Info can be found here. I was interviewed about my ramen hunting and new ramen book for the 朝日新聞, Asahi Shinbun. Published in the print version on July 2nd, 2015. Online (in English) here. I was invited to give a live interview in the studio of nightly English language news program News Room Tokyo. The video and a transcript can be found here. This was my first live appearance on TV. Aired June 16th, 2015 on NHK World. Kansai-based news program. They followed me during a ramen tour. Their site is here. Aired in June, 2015. A show about searching the world for interesting things. In this episode, the TV talent traveled from Japan to New York and London to talk to people about ramen. I joined her in Japan, where we went and had Tequila ramen. The cut out the part where we took shots. It's on YouTube here. Aired on May 16th, 2015 on TBS. Interviewed about the book and my obsession with blogging about ramen in Japan. Aired on May 16th. Some info here. I didn't catch this one, as it was only on in Osaka in the middle of the night. The show featured several "Monster Hunters", or people who are obsessed with something. Apparently the segment before mine was about a girl with large breasts. I'm not making this up, you can read about it here. Aired March 30th, 2015 on Kansai TV. Did a short bit where I introduced a ramen shop on the TBS show Ippuku. Aired on March 16th, 2015. I was consulted about ramen trends and how those relate to Japanese businesses for an article. You can read it here. 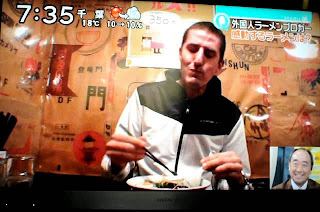 I took part in a ramen special over at NHK World. Great program in English. We ate at Kabochan, Kikanbo, and Soranoiro. Available online over at the NHK World site from February 3rd. Tokyo Crasso is a show about various life-in-Tokyo stories. They profiled me and we went to some great ramen shops. Aired January 230th, 2015 on Tokyo MX. I helped out famous UK food personality Rachel Khoo for a piece she did with the Telegraph UK. Even though I was out of town for most of her trip, I hooked up a ramen tour and day at the ramen school for her. Check it out here. Interviewed for a 4-page article in the MOOK (Magazine+Book) What Foreigners Love About Japan that You Don't Know. Available on bookshelves and online in Japan from October, 2014. Wrote an article about various styles of ramen around Japan for the CNN website. Read it here. October, 2014. 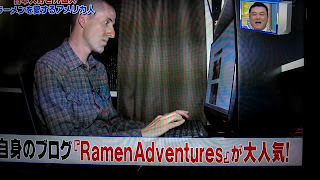 Ramen Adventures YouTube channel was featured on a program about foreigners in Japan. Aired August 18th, 2014. You might be able to see a clip here. 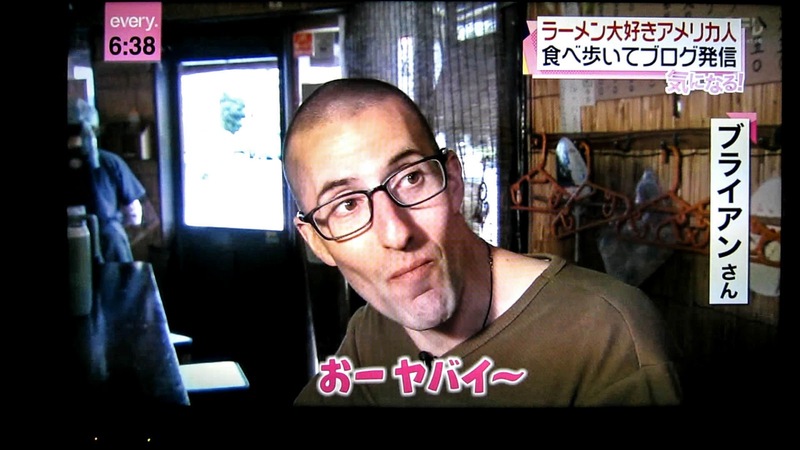 Segment about foreigners in Japan doing things to promote Japanese culture. They followed me to a couple shops, shot me speaking with one of my English students about ramen, and showed me doing a ramen food tour. Aired July 14th, 2014. Toured ramen shops with some of the girls of X21, a junior idol group in Tokyo. The concept was "English Only", and they had to make food commentary using English. A fun show. Airs Friday nights at 1:30am on Asahi TV. Ramen Adventures helped with shows in February, March, April, and May of 2014. Ongoing. Appeared on the excellent Discovery Asia show about ramen. Follows the stories of 5 people involved in ramen culture in Japan. Aired in March, 2014. A late night ranking show. Onegai! Ranking covers any topic you can think of. 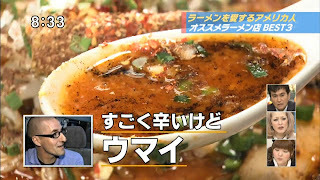 We talked about out recommendations for the upcoming 2013 Grand Tsukemen Fest. Aired 10/25/13 on TV Asahi. A TV show called Ariehen Sekai on TV Tokyo. It aired sometime in 2013 at 4:30am. We took the crew to a couple great ramen shops in Tokyo and Chiba. A morning show in Japan. I took the crew to the new Nagi in Shinjuku. Aired 9/5/13. 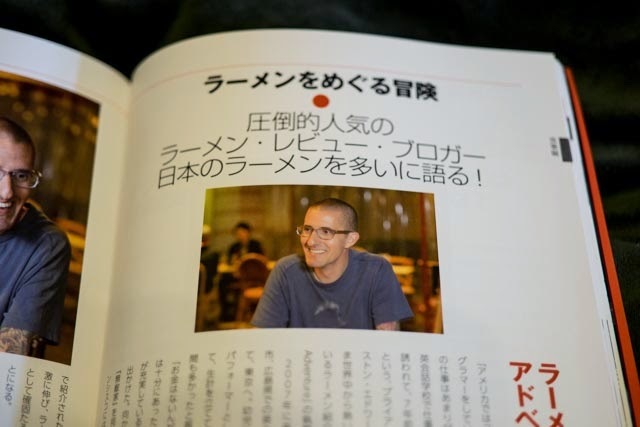 Interviewed in the 8/13/13 issue of Newsweek Japan. 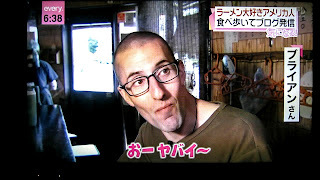 The article is about foreigners doing interesting things related to Japanese culture in Japan. Now, That's an Amazing Face! is a show on TBS. A showcase of interesting people doing interesting things. You can see the clip on YouTube here. Aired 7/13/13 on TBS. Popular Sunday afternoon TBS TV show. The entire hour was all about foreigners and Japanese culture. Spent the day with talent Shinyama Akinobu eating ramen. Aired May 2013. Took the announcer from this daily news show to a few shops where we talked about ramen. Aired May 2013. Helped out writer Adam Sachs in his hunt for tonkotsu ramen. Article here. April 2013. Interviewed at one of my favorite shops for an article about ラヲタ, ramen otaku. Here. April 2013. Helped with an article about people who eat more ramen than me. See it here. March 2013. Interviewed for Chicago-based food-culture website HOGSALT. I also helped them while they were in Japan with reservations and ramen logistics. The interview is here. Helped with the TV show Tokyo Boy. On the show, I take a French friend who I haven't seen in a while to one of my favorite ramen shops, Soranoiro. Aired February 3rd, 2013 at 8pm. Tokyo MX is a local channel in Tokyo. I gave advice to a reporter who ate 3 bowls in one day; in Kyoto, Osaka, and Kobe. She also visited the Osaka Instant Noodle Museum. Kansai Scene is a free English language magazine for the west side of Japan. The article is online here. Appeared on the morning show Shittoko to talk about ramen and took the talent 重盛さと美 to some ramen shops. Aired on October 20th, 2012 at 8am. Gave comments on the state of ramen for a piece about a Texan who is opening a ramen shop in the near future. Appeared here. One of nine selected as a Ramen Ambassador. This project runs on the website ramen.yahoo.jp. Photos for a piece on what to do in some major international cities. July 2012. Wrote a 2 page piece entitled Adventures in Ramen - ラーメン探訪 for the May 2012 issue of the Hiragana Times. 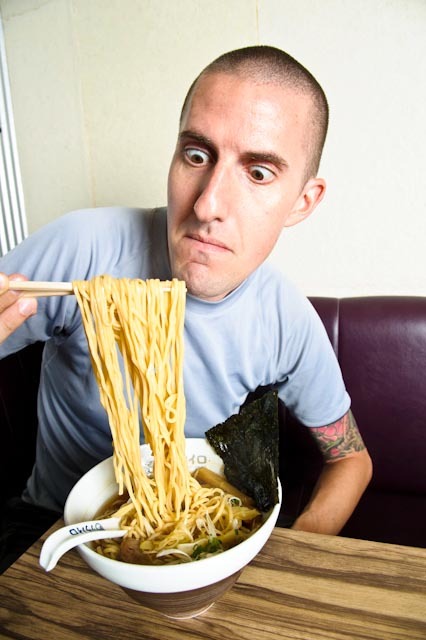 Weekly column focusing on 2 Americans and our views of the ramen scene in Japan. October 2011 until ??? Still going strong after over 2 years! Contributed to the 2010 Best Eats awards on CNNGo. Great articles, not just for ramen but for most popular food styles in some top Asian cities. Nihon de Sekai Go!! featured Ramen Adventures in it's special about foreign views of ramen. Aired on NHK, September 29th, 2011. Zoom In!! SUPER featured Ramen Adventures on their ramen special. I took the crew around to some of my favorite shops. Aired on Nihon Terebi, December 2nd, 2010. I am happy to be the Bento.com Ramen Editor. Check out the site for not only my ramen reviews, but info (in English) on thousands of restaurants in the Tokyo area. One page ramen writeup in the 2010 (6th edition) of the popular guidebook. A Japanese magazine that focuses mainly on translating foreign media's coverage of Japanese interest stories. They translated the NYT article and used some of my original photography for the article. April 2010. Helped guide the Frugal Traveler Mat Gross around Tokyo for his excellent piece on ramen in Tokyo. January 26th, 2010.